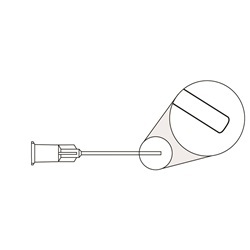 A thin wall cannula allows the advantage of a larger bore through a smaller cannula. The inside diameter is approximately 2 gauge sizes larger, therefore, a 25 gauge thin wall lumen is approximately the same as the inside lumen on a 23 gauge. Thin Wall Anterior Chamber Cannulas are disposable and have straight shafts and blunt tips. Overall length: 22mm. Sold 10 per box.